Taking advantage of the beautiful weather after a week full of temperatures in the upper 90s, I decided to take a walk down to IHOP for this week’s Tasty Tuesday. 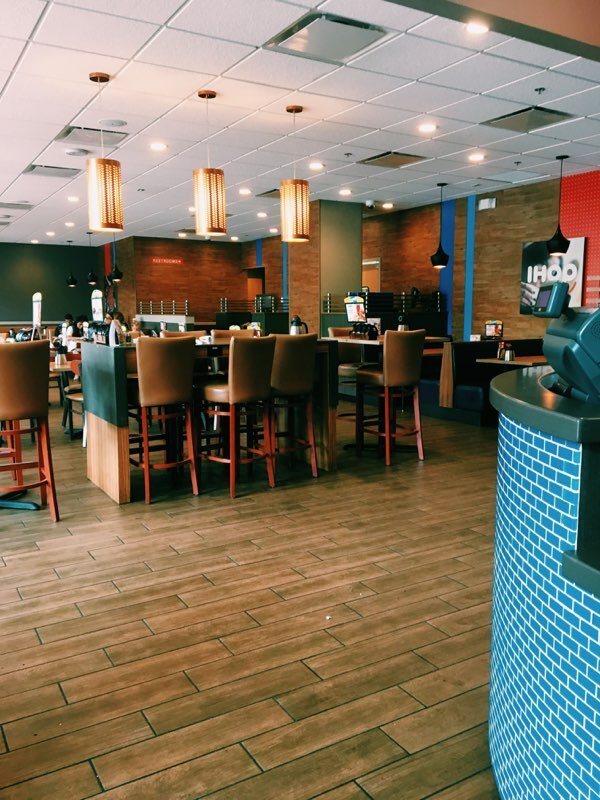 IHOP is located across from Cup-A-Joe, situated right below the Stanhope Apartments, making it close to the parking deck and allowing for easy access. I arrived around 10:45 a.m. on a weekday, not knowing what to expect. I was delightfully surprised to be greeted and quickly sat within the first few minutes of being there. My server was very attentive and provided quick service. While I was talking to her, she mentioned that I had come in during a slower part of the morning, beating the early lunch rush and the typical breakfast crowd. IHOP has so many different options to choose from, especially with their new marketing campaign changing their name to IHOB. I saw some people around me eating burgers and contemplated getting one but, as a true breakfast lover, I had to stick with the staples. I ordered the Ultimate Waffle Sandwich - I was truly blown away. When the menu says 6 pieces of bacon they mean 6 pieces of bacon. 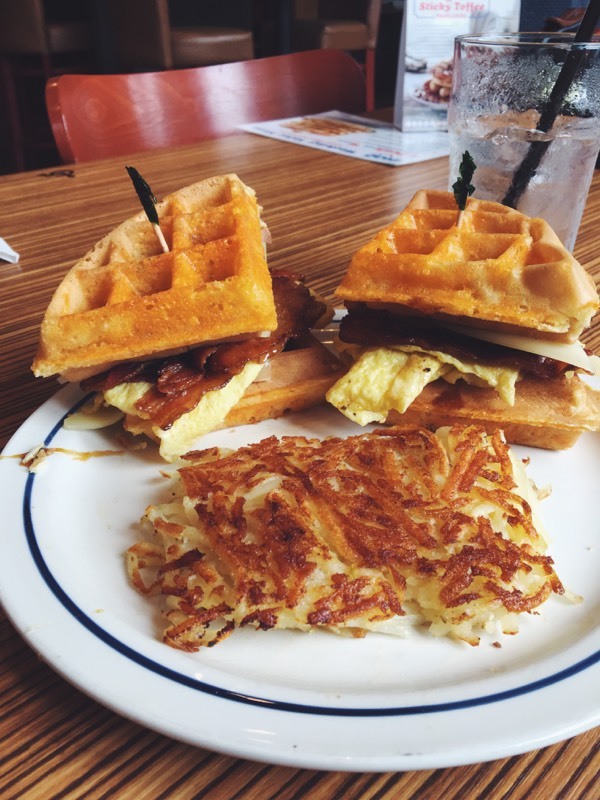 The base of the sandwich is a waffle and it is stacked with bacon, cheese, eggs, more cheese and more bacon followed by another waffle slice. While making it, the cook somehow found the time to hide maple syrup in it, too. The first bite was nothing short of amazing with the crisp waffle-bacon-egg-and-cheese combo. The second bite was even better because you could really taste the maple syrup flavor in it without it being too overpowering or messy. Each bite was better than the last. I ate it all and left barely in room for my hash browns which were just as delicious. 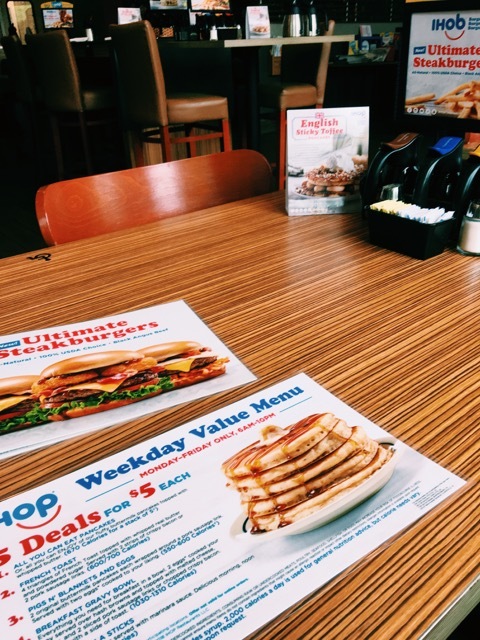 If you're in the neighborhood and looking for a place where there is plenty of options for everyone, IHOP is a great bet. They offer specials during the week that will make a breakfast lover and a lunch lover very happy. IHOP also offers an app where you can place an order and pick it up, in the short time that I was there it seemed that this was a very popular option!